Cooking rice perfectly is a challenge for most of the home cooks and especially the beginners. But with a proper rice cooker, you can cook all the different types of rice flawlessly without much of intervention. Out of all the different rice cookers, the Japanese rice cooker is the most popular. There are various settings options available to cooking rice manually as well as automatically. Moreover, most of them have the options to keep the rice warm without drying. The following article contains the best Japanese rice cookers with multipurpose options. Zojirushi is the most popular brand in the Japanese rice cooker category. Hence, we have listed multiple products of the brand with different features. This one has an attractive look, and it is suitable for a couple of people. The product is quite compact, and the holding capacity is 2 cups. Zojirushi’s rice cookers have a patented triple heater. This ensures that the rice heats up from the sides, bottom, as well as, from the top. Therefore, the cooking will be even, and one can also use it as a warmer to keep to rice perfect for eating. Furthermore, there is a removable steam vent cap that allows you to cook rice at a high temperature without worrying about any overflow. Moreover, you can keep the rice warm at a definite temperature to serve your coming guests hot and fresh rice. On top of that, the unique mechanism does not let the rice become too dry even when you put it in constant warming mode. The heat distribution is even, and it has a non-stick coating for easy cleaning. All the surfaces are BPA-free, and you will find easy settings including a timer. In this Japanese rice cooker, you will be able to cook a variety of items like porridge and sushi. One of the best things about this product is that it has a triple heater. By having the heater on the lid, side, and bottom, it will generate heat from all the sides and will allow quick cooking. This can cook three cups of uncooked rice. Moreover, there is also a washable inner lid which can detach very quickly. The cord is also retractable which allows you to go for easy storing. Besides, you will also be finding a beep signal and an interchangeable melody. The item has GABA brown and healthy brown settings and has the micro computerized fuzzy technology. There is an automatic reheating cycle which will keep your food warm. The rice cooker will allow you to cook multi-menu cooking and there are two delay timer settings. Additionally, you will be getting other accessories like a measuring cup, spatula, and a spatula holder. With different cooking settings, this is an ideal product for your kitchen. This is perfect for a small sized family and is also a lightweight product. This Japanese rice cooker has 4-in-1 cooking settings. It has also got computerized cooking options and includes a thick inner pan of 1.8 mm. The inner lid can easily be removed and cleaned. Apart from being a rice cooker, this is also applicable as a warmer. This has the “tacook” synchro-cooking function. It is micro-computer controlled and will fit in 10 cups of uncooked rice. With this item, you will be getting a cookbook as well as a cooking plate. Besides, you can also quickly remove the steam cap. This will last for a long time and will provide you with healthy and fluffy rice. This is very easy to use and will save your time in the kitchen. Furthermore, the inner pot has a non-stick coating which makes you rice to stay fluffy. This will keep your food warm for up to 12 hours. This is also available in another size which can cook 5.5 cups of uncooked rice. This can also slow cook, and you can make a variety of items like porridge and brown rice in this one. You can also steam your food and avoid cooking oils. 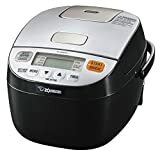 This is another fantastic Japanese rice cooker which has multi-menu cooking options. The triple heart will generate heat from the bottom, lid, and slide. This will give your rice even heating and makes them cook fast. It will also save your time when you are in your kitchen. The inner lid is washable and can easily be detached. This is also very easy to store as it comes with a retractable cord. 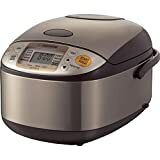 Additionally, if you are cooking in this rice cooker, then you will not get any messy overflows as it will cook your food in high temperature. There is also a steam vent cap which is removable. This comes in the size of 0.54 liter and is perfect for a small family. You can easily cook 3 cups of uncooked rice in this one. The signal is recorded with a beep or interchangeable melody. The body of this rice cooker has stainless steel and makes a perfect décor for your kitchen. Moreover, there are also menu settings to cook the rice of your choice. In this Japanese rice cooker, there are many features which make it a perfect item for your kitchen. This has the option of quick cooking, and you will be able to select from a variety of cooking options. There is also “umami” setting which will extend the soaking as well as the steaming time to cook better rice. In addition to this, there is also steam reduce setting which will reduce the steam up to 50 percent. You can prepare a variety of dishes in this one as this is perfect to make special meals. This requires 120 Volts of power to operate. Additionally, you can check the timing on the LCD control panel and can also delay the time of your cooking. The inner cooking pan is also non-stick and has a platinum infusion. This has many other useful features and will give you healthy and tasty rice. Furthermore, there is also reheat function which takes about 5 to 8 minutes and can also keep your food warm. Whether, brown rice, white rice, or sushi, this one rice cooker can do all for you. 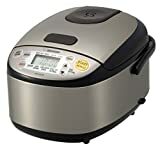 With an electrical rating of 1,230 watts, this Japanese rice cooker comes with many cooking functions. This is a 1-liter rice cooker which can cook 5.5 cups of uncooked rice. You can also use it as a warmer. There are two delay timer settings and will keep your food warm automatically. There is also an option to keep your rice warm for an extended period, and it will preserve the temperature that you require while serving your rice. Additionally, there are also healthy cooking options which give you to select from germinated brown rice, GABA rice, and brown rice. You will be getting flawless rice as it gives superior heat with its Induction Heating technology. The exterior has a stainless steel coating, and there is a triple heater, which will cook your rice quickly. Moreover, you easily detach the inner lid and wash it. This is also an orange LCD display where you can monitor the time. Besides, there is also a timer in the LCD display and has a black inner cooking pan. The product comes with a one year warranty on various parts. It is one of the best Japanese rice cookers to opt for. The Japanese rice cooker is one of the best-rated products, and the holding capacity is 5.5 cups. The unique Syncro-cooking feature lets a user cook the main dishes as well as the rice at the same time. Therefore, it is a time-saver, and the operation starts with just one push of buttons. There are 4 different cooking settings available namely plain rice, brown rice, slow cooking and Synchrony cooking. Due to the availability of these modes, it becomes the suitable rice cooker for any beginner. Coming to the construction, it has a non-stick coating and therefore, getting the rice out or cleaning will be effortless. In the package, you can find the non-stick spatula, cooking plate, measuring cup as well as a cookbook. You can also opt for a bigger size of 10 cups if there are more guests to serve. Besides, the cooking plate is free of BPA and the inner steam cap is detachable. There is no better brand in Japanese rice cooking category than Zojirushi. This one has a single switch operation, and hence, it is easy to use. Moreover, it is compact and suitable for one to two persons. However, you can opt for a bigger size than this 3-cup rice cooker. The nonstick inner cooking pan is highly durable. The handles have a cool touch, and you can transport the cooker from one place to another without using any glove or cloth. The best part of this Japanese rice cooker is that the glass lid has a see-through construction and therefore, a person can keep an eye of the cooking all the time. Moreover, there is a stay cool knob on top of the lid to remove it while cooking. There is also an automatic warm function to keep the rice warm and fresh without drying it. This one of the best Japanese rice cookers includes measuring cup, rice spatula and steaming tray. This is one of the bestselling Japanese rice cookers, and it has a unique construction shape. It is a digital rice cooker, and the capacity is 1 liter or 5.5 cups. The rice cooker is quite advanced and modern in its technology, and it uses the popular Fuzzy logic. There are multi-men settings whereby you can set it to automatic warm, extended warm and reheat cycles as per your requirements. The details about the modes and their applications are available in the user manual. 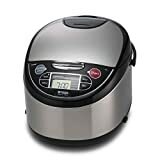 The spherical rice cooker has a nonstick inner pan for uniform heating, and on the exterior, there are a timer, LCD clock, and different menu settings. There are automatic modes for different types of rice and other dishes. Therefore, it is a perfect choice for beginners. The company offers one year warranty, and you will get all the things and accessories you need to have to start cooking instantly. It is needless to say that it is better than most of the best Japanese rice cookers on the list. This is the ultimate Japanese rice cooker with a stunning outlook. It is capable of cooking 6.6 cups of rice, and the overall volume can be 1 liter. There is another variant with double its size. The product has the micro computerized fuzzy logic technology, and there is an automatic keep warm option as well. On top of that, there is another extended keep warm and reheating cycle available. Due to the nonstick inner surface, it is easy to clean and extract the cooked rice. The exterior has stainless steel, and the power cord is retractable. There are two delay time settings with interchangeable melodies and beep signals. Moreover, you can use the cooker to bake cakes and use as a steamer for various items. You can select the cooking function based on the type of rice you have, and the cooked rice will be flawless. The inner lid is washable, and exterior appearance will enhance the beauty of your kitchen. You can choose from any of these best Japanese rice cookers as per your requirements. The most advanced ones have more features to cook main dishes simultaneously or to bake cakes perfectly. While buying the rice cooker of your choice, do check the size and you should select depending on the family members you have and how many cups of rice they have every day. The constructions of all these rice cookers are extremely durable, and they are effortlessly in cleaning and rice extraction after cooking. If you are a beginner or have less time to cook, a rice cooker is a must for you.